Hyperlinks are a great way to add interactivity to your course—they enable learners to click something on your slide and jump directly to the content they need. or some other type of file. These are the sorts of hyperlink actions we'll cover in this tutorial — but it's worth mentioning that in Storyline, hyperlinks are a type of Trigger, and they're actually just one of many types of Triggers you can create. For a deeper dive into Triggers, and how to use them for all kinds of additional interactivity, you can check out the tutorial on Adding and Editing Triggers. Select the item you want to be clickable. 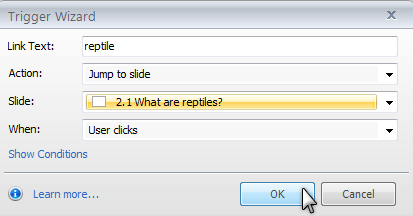 The item you select can be a text box, a word (or a string of words) within a text box, or some other object you've inserted onto your slide, such as a picture, screenshot, shape, caption, or character. Press Ctrl+K on your keyboard. 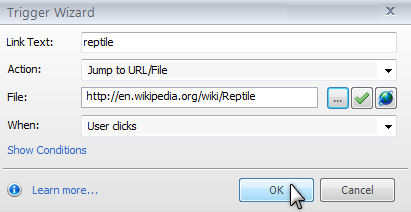 Or, if you're adding a hyperlink to text, right-click the text and choose Hyperlink. Or, click the Insert tab and choose Hyperlink. The window below appears. If you're adding a hyperlink to a string of text, you'll see a field called Link Text which shows the text that you've selected for the hyperlink. You can change that text here if you want. Show layer: This displays a different layer of the current slide. If you choose this, you'll then need to use the Layer field to pick the layer you want to display. For more on layers, see Adding and Editing Slide Layers. Lightbox Slide: This causes whatever slide you choose to appear in a lightbox over the current slide — in other words, everything else in view grows dim, and the lightbox slide appears over the dimmed course. For the destination, you can choose the layer, slide, or scene you want the learner to see, or choose Unassigned if you want to set up the trigger now and come back later to choose the destination. Leave the When: field set to User Clicks. If the Object: field appears on the window, leave it set to whatever object you selected. Use the Action field to select Jump to URL/File. If it's a document or file you currently have on your hard drive, click the ellipse (...) button to browse and select the file. Later, when you publish, Storyline will include a copy of the file itself right along with your course content. The file will be in a folder called story_content/external files. Learners will of course need to have the appropriate software in order to view the file. For example, if the resource is a Word document, learners will need to have Microsoft Word installed on the computer from which they're viewing the course. TIP: If you have a lot of files that you want to provide to your learner, and you want to make them available from anywhere throughout your course, you might want to instead use the Resources tab on the player. Learn more about that in this tutorial. If it's a web page, enter the full URL. To customize the way the window opens, click the globe (Browser options) button. The following window appears, where you can choose whether the browser opens in the current browser window or a new one. 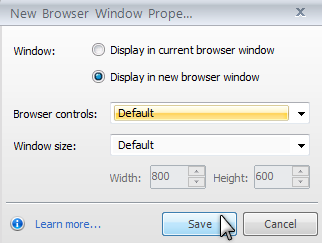 You can also choose the browser controls that appear, and the window size. Click Save once you've made your choices. To the right of the File field on the Trigger Wizard window, you can click the green checkmark to verify that the link you've entered works properly. If your hyperlink is to a file, a window will open with the file highlighted. If your hyperlink is to a URL, the web page you selected will open in your browser. If you apply a hyperlink to text, the text color changes and an underline appears. Also, when users hover over the hyperlink in your published course, a semitransparent hover color appears, in a color that matches the hyperlink color. 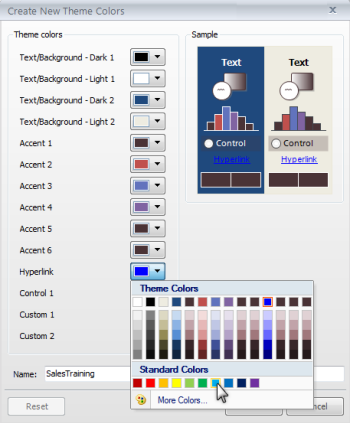 Click the Design tab and choose Colors. The design theme you're using will be marked by a thin orange outline. If you're using a Custom theme (these appear in the top section of the list), right-click it and choose Edit. 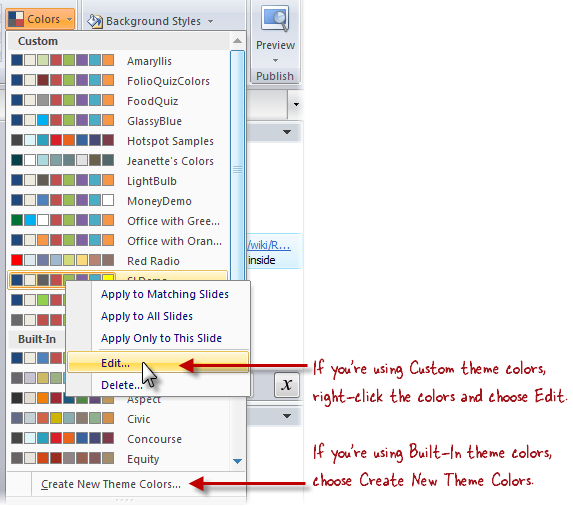 If you're using a Built-In theme, choose Create New Theme Colors (since the built-in ones can't be edited). In the color theme editor, find the Hyperlink color and change it to whatever you like. If you're creating a new set of theme colors rather than editing an existing custom theme, you can enter a name for the new color theme in the Name field. Click Save to return to your course. If you apply a hyperlink and later need to change its destination, you can do that quickly via the Triggers panel. Find the trigger you set up previously, and click the destination (it appears in blue with an underline). Then just make whatever changes you need. If you need to change the type of hyperlink (for example, you want to change it from a document hyperlink into a link that points to a slide in your course), select the trigger and either double-click it, or click the pencil icon (Edit the selected trigger). This pops up the trigger wizard where you can make any changes necessary. If you preview a part of your course that contains hyperlink, you might find that the hyperlinks don't work as expected. To properly test hyperlinks, you'll need to publish your course and test the hyperlinks in your published output.